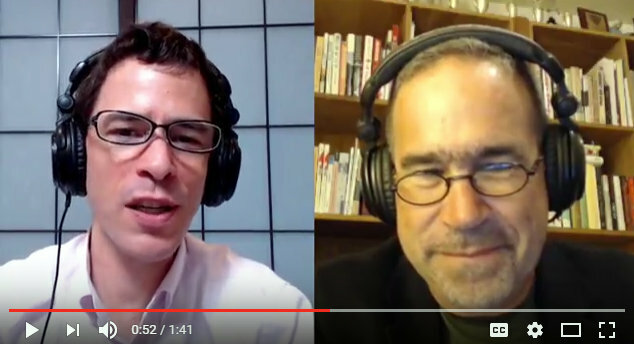 More Redmond Reviews and a brand-new AlphaGo vs. AlphaGo series are coming soon. 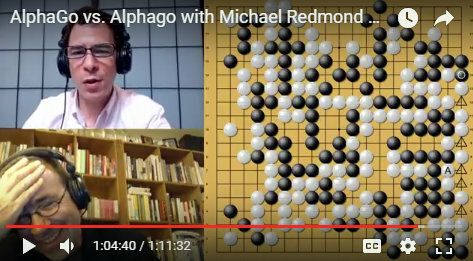 A brief video just released reveals that Michael Redmond 9P is working on a new series of video commentaries with E-Journal Managing Editor Chris Garlock, focusing on the AlphaGo self-played games as well as recent tournament games by Redmond himself, that have been influenced by AlphaGo. “AlphaGo jumps into the middle game pretty quickly (and) the fighting in the middle game is amazing and there are a lot of moves that took me by surprise,” says Redmond. “Michael has been working incredibly hard to explain these incredibly complicated games so stay tuned and fasten your seatbelt!” Garlock added. The videos are being produced by Michael Wanek. In my report at the end of May, I took the liberty of writing about a shogi debutant who was making waves. 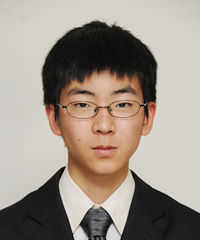 First he set a record by becoming the youngest player, at 14 years two months, to qualify as a shogi professional. That earned him some attention in the media, but the attention became a media frenzy when he started playing games and didn’t lose. 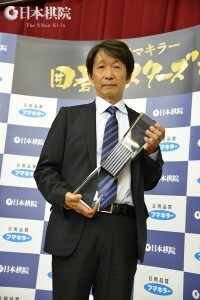 I wrote the previous report when he reached 19 successive wins, the seventh-best in shogi. 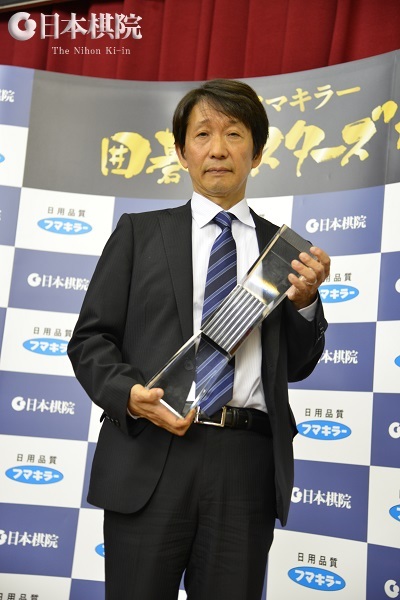 On June 28, he matched the previous record of 28, set in 1987, then on June 29 he broke it, scoring his 29th win over the only other teenaged shogi professional, Masuda Yashiro 4P (aged 19), who won the King of the New Stars title last year. By this time, the media had become obsessed with Fujii. A hundred reporters turned up at the Shogi Hall to see the above-mentioned games start. Throughout the day (both games lasted over 11 hours), TV provided a stream of updates. The game was the lead-off item on news programs, even while it was still in progress and they switched to live coverage when it ended. 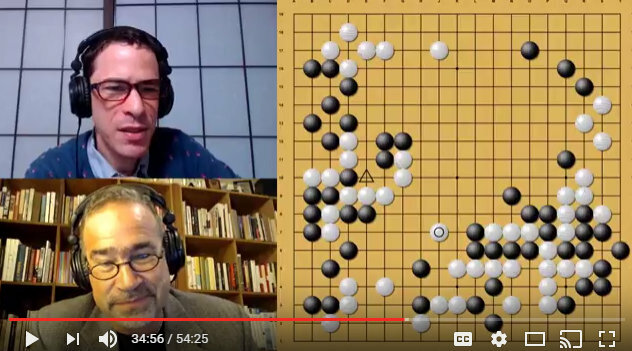 The daytime “wide shows,” usually devoted to colorful crimes and scandals, hired shogi professionals to give commentaries. (Newspapers printed extras for both the 28th and 29th games. There were also two Net broadcasts, with a combined audience of 11 million.) It felt as if the whole nation shared the disappointment when Fujii finally suffered a loss in his 30th game. Fujii’s success sparked a shogi boom, especially among young children, who flocked to join shogi classes. 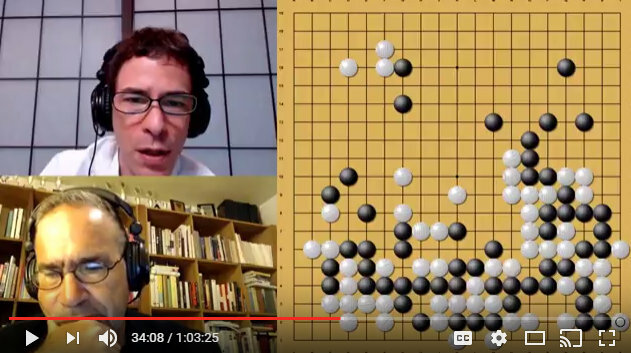 Go has never experienced coverage like this, and apparently it surpasses the media attention earned by Habu Yoshiharu’s Grand Slam on 1996 (as in go, a simultaneous grand slam has been achieved only once). Fujii was born on July 19, 2002, so he turns 15 next month. The previous record for a debutant was 11 successive wins. Before Fujii go has the upper hand, with Hiroe Hiroyuki 9P winning his first 12 games in 1983 (he was 16). He is followed by Yoda Norimoto (aged 11) and Mizokami Tomochika 9P (aged 15), and Ida Atsushi 8P, all with 11 (they were all 1-dan, of course). By coincidence, Fujii’s new record of 29 successive wins is the same as the go record, set by Sakata Eio in 1963-64. The content is not the same, however. 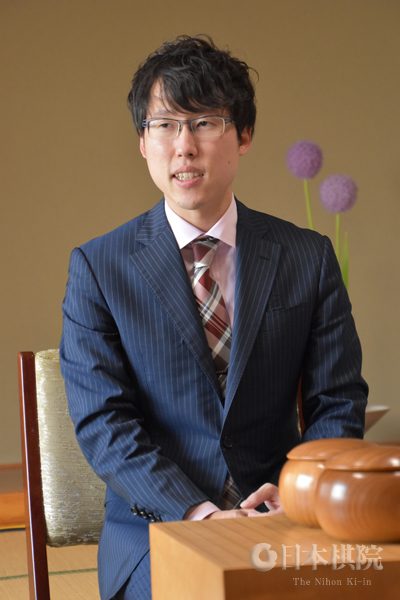 The average rank of Fujii’s opponents was 5.77 (by the way, the win over Habu Yoshiharu I mentioned in my previous report was not part of the streak; it may have been an unofficial game, but I can’t find it). 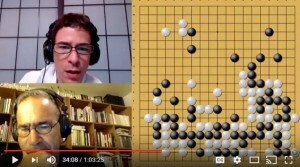 Sakata’s opponents included the elite of the contemporary go world. I’m not trying to carp about Fujii’s record. 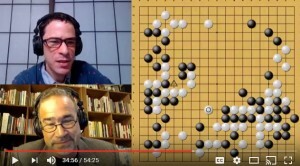 As a go player, I followed the Fujii saga with amazement and the purest envy. As far as I know, Iyama’s grand slam last year, garnered just a minute or two on the news. Closing note: One program has a segment devoted to shogi terms that had passed into general speech and threw in a few go terms for good luck. Unfortunately, their diagram for “dame” (in the sense of worthless points) was completely wrong. 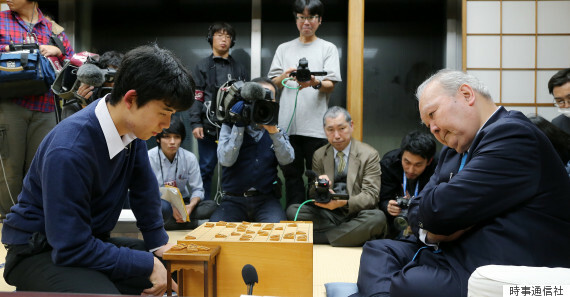 photo (top right): Fuji playing Kato Hifumi, at 77, the oldest active shogi player. First game of the winning streak. Kato retired around the time Fujii set his record. Out with the old, in with the new. 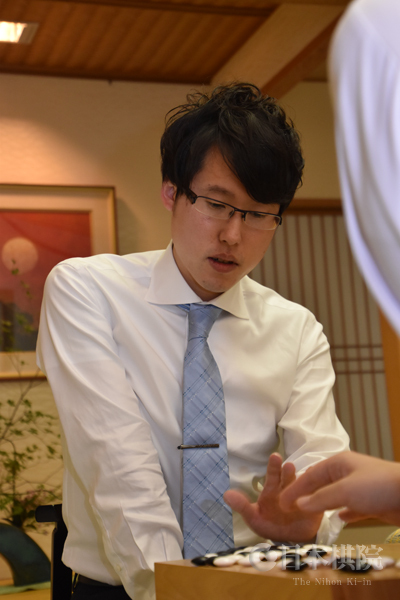 He was the previous youngest shogi pro. Komatsu wins Samsung seat: The international preliminary tournament for the 22nd Samsung Cup was held in Korea from June 28 to July 3. Twenty-seven players from Japan took part in the various categories. The only successful player was Komatsu Hideki 9P (right), who scored five successive wins in the Senior division and gained a seat in the main tournament. He was also successful in the preliminary in 2012 and 2013. The main tournament begins on September 5. Seeded for Japan are Iyama Yuta and Yamashita Keigo. Fujisawa wins Senko Cup: The semifinals in the 2nd Senko Cup were played in Akekure (Dawn and Dusk), a high-class Japanese inn, on July 14. Xie Yimin (B) beat Nyu Eiko 1P by 4.5 points and Fujisawa Rina (W, left) beat Mukai Chiaki 5P by 3.5 points. The final was played on July 16 at the same venue. Taking white, Fujisawa Rina made a blunder, but she fought on and recovered and in the end won by 2.5 points. She won this title for the first time and now has four women’s titles. Overall, she has now won six titles and is still only 18 (her birthday is on September 18). 42nd Kisei tournament: The first game in the third round of the S League was played on July 6. Cho U 9P (W) beat Yamashita Keigo 9P by half a point. The other two games were played on July 13. Kono Rin 9P (B) beat So Yokoku 9P by resig. and Ichiriki Ryo 7P (W) beat Murakawa Daisuke 8P by resig. After three rounds, Ichiriki, as the only undefeated player, has the sole lead. Two players are on 2-1: (in order of rank) Kono and Cho U. Yamashita and Murakawa are on 1-2 and So is on 0-3. In a game in the A League, played on June 29, Yoda Yorimoto (W) beat Kyo Kagen by 2.5 points (see next item). Kyo still has the provisional lead on 5-1, but he has the lowest rank, that is, equal 7th in an eight-player league. Yoda and Takao Shinji Meijin are tied on 4-1 and, being more highly ranked, are threats to Kyo. Cho Chikun on 4-2 is also theoretically in the running for first place. Yoda scores 1,100 wins: The above win against Kyo was Yoda’s 1,100th as a pro. He has 572 losses, two jigos, two no-results. He is the 12th Nihon Ki-in player to reach this landmark, and his winning percentage of 65 is the 6th best. At 51 years four months, he is the third youngest, and, at 37 years two months, the 4th quickest. Iyama makes good start in Gosei defence: The first game of the 42nd Gosei best-of-five title match was held at the Matsushima Ichi-no-bo, a mixed Japanese- and Western-style hotel in Matsushima Town in Miyagi Prefecture on June 22. It was one of the events celebrating the 120th anniversary of the founding of the Kahoku Shinpo, a Sendai newspaper belonging to the Newspaper Go Federation, a group of regional newspapers that sponsor the tournament. 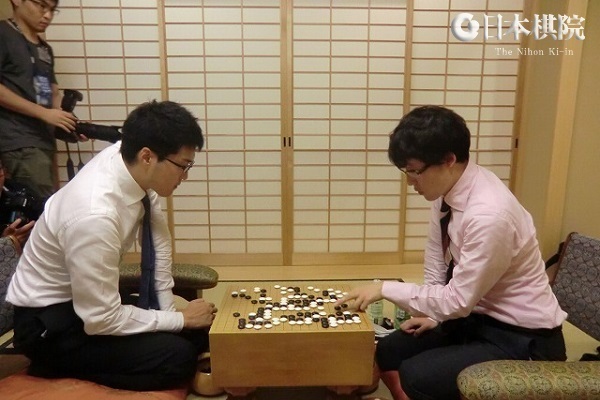 Taking white, Iyama Yuta (right) held the initiative for much of the game and forced the challenger Yamashita Keigo 9P to resign after 190 moves. This is a good start to Iyama’s attempt to win his sixth successive Gosei title. The second game will be held on July 19. The gap of four weeks was obviously left to fit in some Honinbo games; by finishing off that title match with straight wins, Iyama earned himself some valuable rest time (each two-day game takes four days when travel time is included). Fujisawa Rins wins Aizu Central Hospital Cup: Fujisawa Rina 3-dan won the third game of the 4th Aizu Central Hospital Women’s Hollyhock Cup title match to take the title for the second time. Winning it this year shows good timing, as the title has just switched to the challenger system. Fujisawa will meet a challenger in title match next year instead of starting out in the final knockout section of the tournament. The third game was held at the Nihon Ki-in headquarters in Tokyo on June 23. Xie Yimin drew black in the nigiri. Xie set up a large moyo, and when Fujisawa set out to reduce it, her invading group came under severe attack. This fight was so big that it decided the game. When Fujisawa cleverly made life for her group, Xie had to resign just 120 moves into the game. This match was a clash between the two players holding all the women’s titles. Xie held the Senko Cup, the Women’s Kisei, and this title, while Fujisawa held the Women’s Meijin and Honinbo titles. With this win, giving her three titles to Xie’s two, Fujisawa established herself as the top woman player. Prize money for the women’ titles is: Senko Cup: 8,000,000 yen; Hollyhock Cup: 7,000,000; Women’s Honinbo: 5,500,000; Women’s Kisei: 5,000,000; Women’s Meijin: 3,500,000. 42nd Meijin League: In a game held on June 22, Cho U 9P (B) defeated Sakai Hideyuki 8P by 4.5 points. 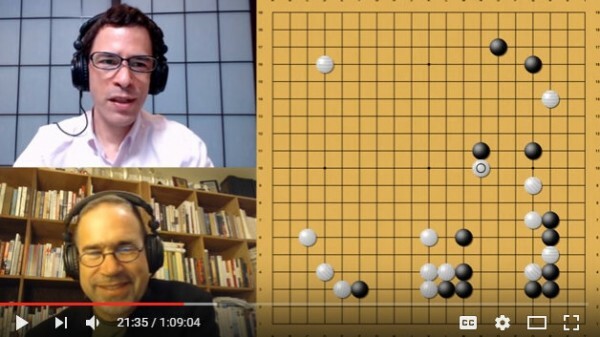 This took Cho’s score to 3-4; as he is ranked #4, his chances of retaining his league seat have improved. On July 10, Yamashita Keigo 9P (W) beat Ko Iso 8P by resig. and Yo Seiki 7P (B) beat Sakai Hideyuki 8P by resig. As he has a bye in the final rounds, Yamashita has finished his games; on 5-3 he is sure of retaining his place but has no chance of challenging. Yo has improved his score to 3-4, after starting with three losses; his last game is against Iyama Yuta – if he wins that, he has a chance of keeping his place. League leader is Iyama on 6-0, two wins clear of the field. On July 6, Hane Naoki 9P (W) beat Kono Rin 9P by resignation. Hane is on 2-5, so this win may have come too late for him to retain his seat. Kono Rin is 3-4, so he has a better chance. Iyama defends Honinbo title: The fourth game of the 72nd Honinbo title match was played at the Sun Great Miyako culture hall in the town of Miyako, Fukuoka Prefecture on June 15 and 16. Taking white, Iyama Yuta (Honinbo Monyu) convincingly outplayed the challenger, Motoki Katsuya 8P, and secured a resignation after 204 moves. Iyama thus won the match 4-0 and defended his title. This is his sixth Honinbo title in a row. Iyama took the lead in the first fight of the game and fended off Motoki’s efforts to catch up. It was a disappointing series for Motoki, who still hasn’t picked up a win over Iyama in any tournament. After the game, Motoki commented; “I felt there was a gap between us. My task now is to try to narrow it as much as I can.” The commentator for the Mainichi Newspaper, Kobayashi Satoru 9P, commented: “This is the best Iyama has playd for several years.” You could say that Motoki was unlucky in running into Iyama in his title-match debut, but then it’s hard not to, with Iyama holding six of the seven big titles. One of the advantages of finishing off the series early for Iyama is that he’ll get extra rest time, though his next big game comes with less than a week’s break: his Gosei defence against Yamashiro Keigo starts on June 22. 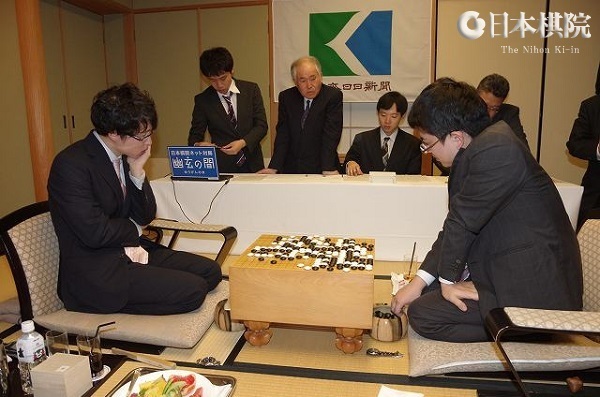 42nd Kisei S League: Two games were played in the top Kisei league on June 15. Ichiriki Ryo 7P (B) beat Yamashita Keigo by resig,; Murakawa Daisuke 8P (B) beat So Yokoku 9P by resig. On 2-0, Ichiriki is the only undefeated player. Kono Rin 9P, Yamashita, Murakawa, and Cho U 9P are all on 1-1, and So Yokoku is on 0-2. Yamashiro reaches 1,200 wins: Yet another player has reached the landmark of 1,200 wins. In a game in Preliminary B of the Ryusei tournament, played on June 12, Yamashiro Hiroshi 9P (formerly of the Nagoya branch of the Nihon Ki-in, but now affiliated with the Tokyo headquarters to make it easier to c opy with his duties as vice president of the Nihon Ki-in) beat Fukui Masaaki 9P to score his 1,200th win. He has 616 losses and 7 jigos, for a winning percentage of 65.8. He is the eighth player to reach this landmark (four days after Yuki Satoshi); he is 58 years ten months, so it took him 45 years two months. Aizu Central Hospital final tied: Two games in the best-of-three final of the 4th Aizu Central Hospital Women’s Hollyhock Cup were held in mid-June at the Konjakutei inn in Aizu Wakamatsu City. 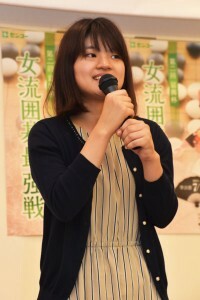 On June 16, Fujisawa Rina (B) won the first game by resignation, but in the second game, played two days later, Xie Yimin (right) fought back to win by 4.5 points. That makes a third game necessary; it will be played at the Nihon Ki-in in Tokyo on June 23. “Hunglong” in my previous report was a mistake for “Huanglong.” I believe that a fussy spell-checker is responsible, but I should have caught it.